Garmin International Inc., a unit of Garmin Ltd. (NASDAQ: GRMN), the global leader in satellite navigation, today announced the fleetTM 660 and 670, two new fleet navigators that combine the simplicity of Garmin navigation with the unique customization options of Android. With the fleet 660 for local fleets and the fleet 670 for commercial truck fleets, service providers can introduce customized applications and value-added services that meet the unique requirements of their customers. The new devices also connect to and control a wide range of external devices over Wi-Fi®, Bluetooth®, or serial cable. The ubiquity of the Android platform makes service providers less dependent on third-party technology companies when developing customized fleet solutions. Providers can easily integrate existing applications from their partners for signature captures, work orders, or inspection reports, for example. The easy-to-use interface is fully customizable and applications and widgets can be added onto the device home screen. The fleet 660 and 670 hardware is optimized for in-cab use with a dust-proof design, high-sensitivity GPS, extra loud speaker, and a sunlight readable, 6-inch capacitive touch screen that makes it easy to see driving-related information at a glance. A powered magnetic mount allows for a quick and easy removal between vehicles. Through Bluetooth and Wi-Fi the devices wirelessly connect to a black box data transponder or other sensors and peripherals, such as a wireless printer or card reader. The fleet 660 and 670 include the latest navigation technology from Garmin, such as Garmin Real Directions™, voice activated navigation, Active Lane Guidance with voice prompts as well as free lifetime traffic1 and maps2. Both devices also feature an integrated gyroscope to record and analyze driving behavior and support Near Field Communication (NFC) for driver and vehicle identification and data synchronization. The fleet 660 is designed for local-service fleets while the fleet 670 is ideal for commercial long-haul trucking fleets with its trucking-specific functions, such as route calculation based on truck attributes, trucking points of interest, Hours of Service (HOS) logging, and International Fuel Tax Agreement Documentation (IFTA). The fleet 660 has suggested retail price of $399.99 and the fleet 670 has a suggested retail price of $449.99. Both devices are expected to become available in the fourth quarter of 2014. For additional information regarding these devices, visit garmin.com/solutions. Garmin International Inc. is a subsidiary of Garmin Ltd. (NASDAQ: GRMN), the global leader in satellite navigation. Since 1989, this group of companies has designed, manufactured, marketed and sold navigation, communication and information devices and applications – most of which are enabled by GPS technology. 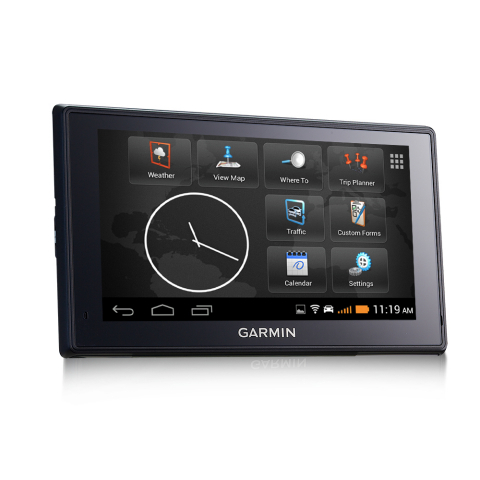 Garmin’s products serve automotive, mobile, wireless, outdoor recreation, marine, aviation, and OEM applications. Garmin Ltd. is incorporated in Switzerland, and its principal subsidiaries are located in the United States, Taiwan and the United Kingdom. For more information, visit Garmin’s virtual pressroom at www.garmin.com/pressroom or contact the Media Relations department at 913-397-8200. Garmin and fleet are registered trademarks of Garmin Ltd. or its subsidiaries. Wi-Fi is a registered trademark of Wi-Fi Alliance. Bluetooth is a registered trademark of Bluetooth SIG. Android is a trademark of Google Inc. All other brands, product names, company names, trademarks and service marks are the properties of their respective owners. All rights reserved. This release includes forward-looking statements regarding Garmin Ltd. and its business. Such statements are based on management’s current expectations. The forward-looking events and circumstances discussed in this release may not occur and actual results could differ materially as a result of known and unknown risk factors and uncertainties affecting Garmin, including, but not limited to, the risk factors listed in the Annual Report on Form 10-K for the fiscal year ended December 28, 2013, filed by Garmin with the Securities and Exchange Commission (Commission file number 0-31983). A copy of such Form 10-K is available at www.garmin.com/aboutGarmin/invRelations/finReports.html. No forward-looking statement can be guaranteed. Forward-looking statements speak only as of the date on which they are made and Garmin undertakes no obligation to publicly update or revise any forward-looking statement, whether as a result of new information, future events, or otherwise. The fleet 660 and 670 have not been authorized as required by the rules of the Federal Communications Commission. These devices are not, and may not be, offered for sale or lease, or sold or leased, until authorization is obtained. 1Lifetime traffic extends for the useful life of your Garmin traffic receiver or as long as Garmin receives traffic data from its traffic supplier, whichever is shorter. A traffic receiver’s “useful life” means the period during which the receiver (a) has the required technical capabilities to utilize current traffic data service and (b) is capable of operating as intended without major repairs. Traffic content not available in all areas. 2 Lifetime Maps entitle you to receive map updates when and as such updates are made available by Garmin during the useful life of 1 compatible Garmin product or as long as Garmin receives map data from a third-party supplier, whichever is shorter. For the meaning of a product’s “useful life” and for other important terms and conditions, please see http://www.garmin.com/en-US/legal/lmdisclaimer.